Most employees must be paid overtime and nearly all must be paid minimum wage. However, Florida employers sometimes deny the full protection of those laws to employees who earn commissions or tips as part of their compensation. Florida wage and hour lawyers are aware that many employers misapply the law to deprive employees of the minimum wage and overtime earnings that the law entitles them to receive. Two important legal rules apply to employees who are paid a commission and to employees who earn tips. Florida employers commonly misapply those rules to deny minimum wage and overtime pay to their employees. more than half of the employee’s earnings in an employer-defined “representative period” must come from commissions or tips. Federal regulations flesh out each of those standards in more detail, making it possible for commissioned employees and their employers to understand when overtime is or is not required. Many employers, however, disregard the rules and treat all commissioned employees as if they are exempt from overtime. A common problem is that employers treat commissioned employees as exempt in each pay period, whether or not the exemption applies. To determine whether an employee is exempt in a pay period, the employee’s total earnings must be divided by the number of hours that the employee worked in the pay period. If the result is less than one-and-a-half times the minimum wage, the employee is not exempt in that pay period. Some employers pay a straight commission in each pay period, even if the commission is less than minimum wage for the hours worked during the pay period. When the happens, the employee is denied the right to receive minimum wage under the FLSA. Another problem occurs when an employer decides that more than half of an employee’s earnings come from commissions by selecting a “representative” period that isn’t really representative. For example, suppose the employer selects the month of December, when sales are high, as a representative period. If commissions do not represent more than half of the employee’s earnings during most other months, the employer is probably violating the law by classifying the employee as exempt from overtime. If you are paid commissions but you are not certain that your Florida employer is obeying minimum wage and overtime laws, you may be entitled to compensation. Get advice from an experienced wage and hour lawyer at Robert S. Norell, P.A. Restaurant servers and other employees who earn tips must earn the Florida minimum wage of $8.25 per hour. 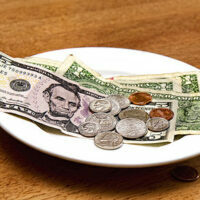 Under the FLSA and Florida law, however, employers can apply a “tip credit” to the wages of qualified tipped employees. Tip credits allow employers to pay less than minimum wage by adding tips that an employee receives to the wages that the employer pays. The difference between the amount the employer pays and the minimum wage of $8.25 per hour is the tip credit. In Florida, the maximum tip credit is $3.02 per hour. Tipped employees who earn an hourly wage must also be paid overtime when they work more than 40 hours a week. If, after applying a tip credit, an employee is being paid the Florida minimum wage, the employee’s time-and-a-half overtime rate is $12.38. The employer then subtracts the tip credit from $12.38 to arrive at the adjusted overtime rate that the employee must receive for overtime hours. Restaurants and other businesses that require employees to contribute their tips to a “tip pool” may not be entitled to a tip credit. A tip pool is valid under the FLSA only if the tips are shared among employees who regularly receive tips (such as servers and bartenders). If the tip pool is shared with employees who do not usually receive tips (like dishwashers) or if the owner or manager keeps any part of the tip pool, the tip pool is not valid and the employer is not entitled to claim a tip credit when calculating minimum wage or overtime. An invalid tip pool entitles the employee to receive full minimum wage for all hours worked (and full overtime wages for all overtime hours) without any tip credit reduction. Employers can also get into trouble by requiring employees to contribute more to a tip pool than they receive in tips, or by contributing so much that they don’t receive minimum wage. Failing to notify employees of tip pool rules can also invalidate a tip pool. When employers take a tip credit based on a tip pool that isn’t valid, employees may be entitled to unpaid minimum wage, overtime wages, and penalties. If your hourly or overtime wage was reduced by a tip credit and your employer used a tip pool that allows tips to be shared with anyone other than servers, bartenders, and other employees who regularly receive tips, then you may be entitled to compensation. Call an experienced Florida wage and hour lawyer at Robert S. Norell, P.A. for a free case evaluation.